In stock -This product will ship today if ordered within the next 1 hours and 16 minutes. Higher Potency Omega 3, Fatty Acids from Pure Fish Oil. 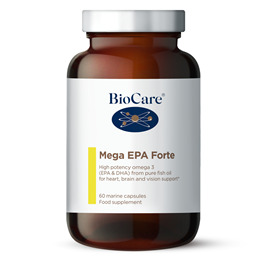 BioCare Mega EPA Forte is an extra high potency omega 3 fatty acid providing a huge 790mg EPA and 530mg DHA, from pure fish oil in a natural triglyceride form. Fish oil capsule sourced from wild pacific anchovies and sardines. Omega 3 fatty acids help maintain a healthy heart; help maintain the integrity of the epithelial tissue lining the lungs and intestinal tract and the skin. All in a greatly simplified, hypoallergenic capsule shell, now clear in colour. Fish oil concentrate supplies a good source of the omega-3 fatty acids EPA and DHA, two essential fatty acids. Mega EPA Forte contains optimum amounts of DHA and EPA – essential fatty acids that contribute to many biochemical functions within the body. They are used as building blocks for cell membranes and form the basis of chemical messengers, supporting the function of many body systems such as the cardiovascular, nervous, reproductive and immune systems. DHA is also needed for proper growth in growing babies and children, particularly for neural development and maturation of sensory systems. High potency capsule suitable for daily use. Provides fish oil from anchovies and sardines and is free from detectable PCBs and contaminants. Contains antioxidant vitamin E (natural mixed tocopherols) for enhanced stability. Omega-3 fatty acids support the heart and facilitate the utilisation of oxygen by heart muscle. Omega-3 fatty acids support the epithelial tissue lining the lungs, intestinal tract and the skin. Fish Oil*, Capsule Shell (Fish Gelatin* and Glycerin) Sweet Orange Oil, Natural Mixed Tocopherols **, Sunflower Oil, D-Alpha Tocopherol. Take 1 capsule twice daily with food or as professionally directed. This product should not be used as a substitute for a varied and balanced diet and healthy lifestyle. Do not exceed the stated recommended daily intake. Do not purchase if the seal is broken. Keep out of reach of children. If you are under medical supervision, please consult a doctor before use. Caution is advised with anti-coagulant medication. Below are reviews of Mega EPA Forte - High Potency Fish Oil - 60 Capsules by bodykind customers. If you have tried this product we'd love to hear what you think so please leave a review. I think it's great value product and very high EPA and DHA. I used to get dry skin and inflamation in my hip joint after old injury. I have noticed improvement in my skin and haven't felt any more pain in the hip but i do have fish oil every day it's worth it. 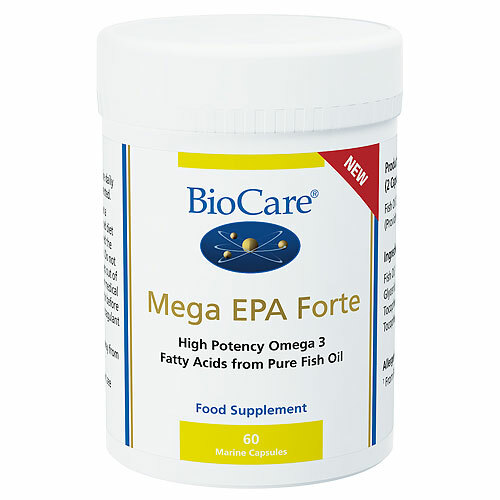 BioCare Mega EPA Forte is a high potency omega 3 fatty acid (EPA & DHA) from pure fish oil in a natural triglyceride form. Omega 3 fatty acids help maintain a healthy heart, lungs and intestinal tract and the skin.